Derek said: ‘There’s a beautiful fisherman’s cottage here, and if it was ever for sale, I think I’d buy it.’ As we neared the cottage, black varnished with bright yellow window frames , we saw the green-and-white ‘For Sale’ sign – the improbability of it made the purchase of it inescapable. Dungeness is not the middle of nowhere. There is a railway and a good road, with regular traffic to and from the power station, and plenty of huts and cottages. But it is on the edge of things, and on the edge of Kent and England. To stand looking out across the banks of shingle to the grey mass of sea and sky when the wind bites and the rain stings, is to feel a sense of isolation and of hostile Nature that the last person on Earth might feel. 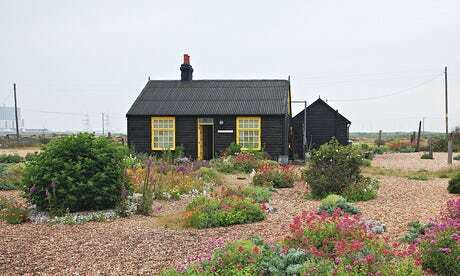 When Derek Jarman, the filmmaker and artist, bought Prospect Cottage in 1986 it was the bleakness of Dungeness and the spartan living quarters of the cottage – ’four rooms off a central corridor’ – that drew him in. Later that same year he was diagnosed as HIV positive. At the time this was an almost certain a death sentence. 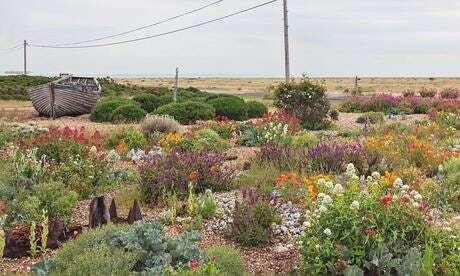 At first Jarman had no thought of creating a garden amid the unpromising shingle and fierce winds of Dungeness. Perhaps his new condition prompted him to begin the planning and planting and tending. To begin a garden is to believe, or to hope, that one has a future, that the investment of time and care is not futile. It started with pieces of flint, driftwood and iron found on the beach, taken back to the cottage and arranged. Then Jarman began digging small holes in the shingle, packing them with manure from a local farm. 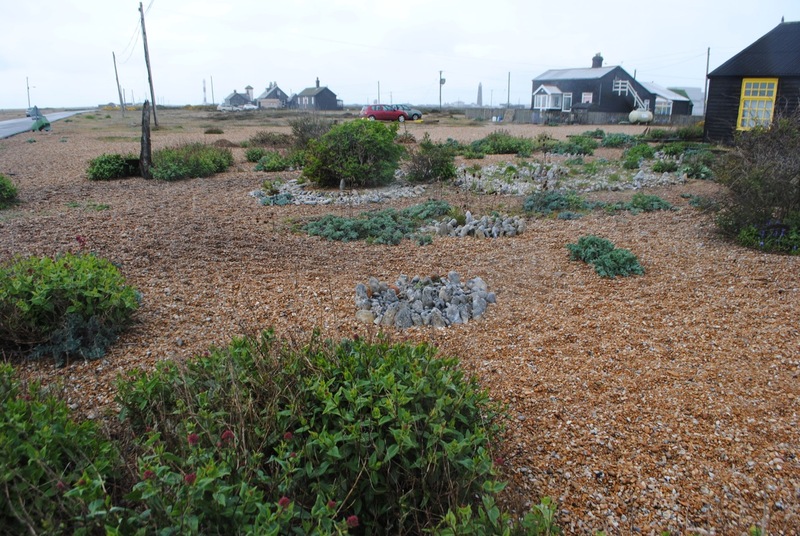 ‘The plants were just plonked in and left to take their chances in the winds of Dungeness’, he wrote. He worked mostly with plants that were native there: dog roses, sea kale, blackthorn, poppies, valerian, broom among them. Initially he viewed the garden as ‘a therapy and a pharmacopoeia’. But as it grew in size and complexity, it became a more artistic undertaking: colour, form, composition and meaning were considered, assembled, refined. The arrangement of flowers and shrubs became more formal. Miniature stone circles and stark sculptures of wood and iron appeared. John Donne’s poem ‘The Sun Rising’ was embossed on the side of Prospect Cottage, a kind of incantation and credo. But the garden always had its practical features. Wooden troughs filled with imported topsoil were built to cultivate herbs and vegetables. Jarman kept bees, in a hive made from old railway sleepers. ‘My hive is four storeys tall and produces pounds of honey as the Ness is never without flowers,’ he wrote. It would be misleading to portray the garden as Jarman’s work alone, though he was the organising intelligence. Friends helped him with plant knowledge and selection, built the troughs, put up the Donne poem, and, as his illness sapped his strength and energy, took over the care of it all. In the end the garden had become an elegy for a life that was fast closing and for the lives of friends and lovers that had already closed. Derek Jarman died in 1994 and is buried down the road from Dungeness in St Clement’s, Old Romney. 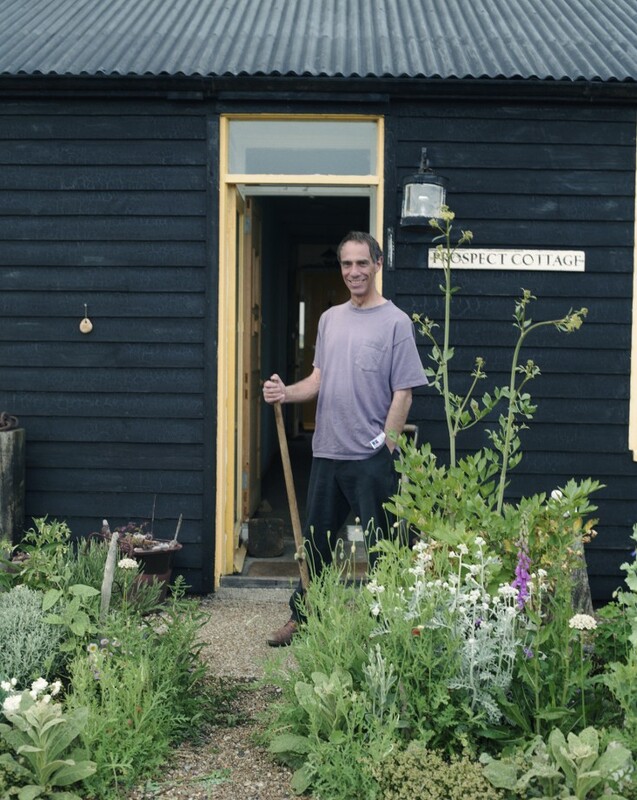 The book Derek Jarman’s Garden, with text by Jarman himself and photographs by Howard Sooley, a stalwart friend and contributor of gardening advice and labour, was published posthumously, his last work (all the quotes in this post are from that book). Prospect Cottage has new owners now and the garden is less profuse than it was in Jarman’s day. The sculptures are gone and the beehive too. But the place retains the psychic imprint of the man who sensed something special and sympathetic in this bleak landscape and chose to live the last stage of his life there. The dying Jarman called the garden his ‘Gethsemane and Eden’. It is also, preserved in the photographs of Howard Sooley, a kind of epitaph.